For several centuries after the fall of Constantinople, Greek theological writing was dominated by an arid scholasticism. This paper seeks to show how since the Second World War modern Greek theologians, with the help of a number of diaspora theologians and Western patristic scholars, have re-engaged with the Greek Fathers. 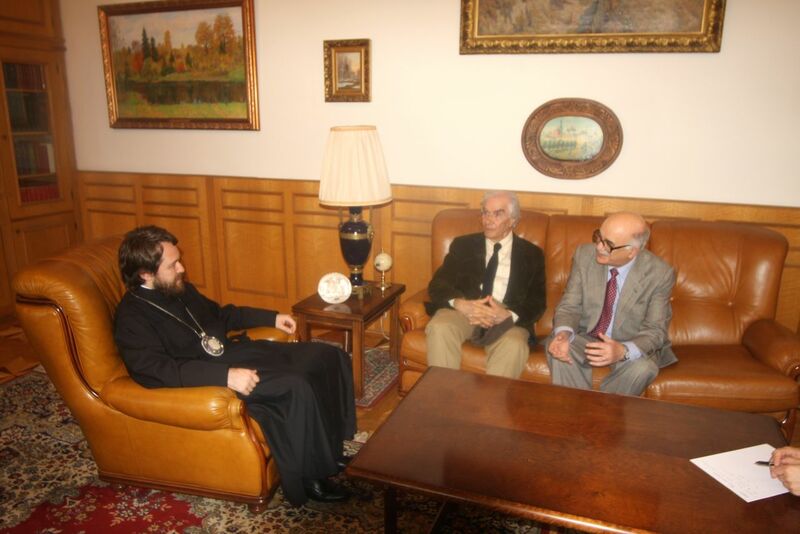 Four theologians are discussed in some detail: Gontikakis, Nellas, Yannaras and Zizioulas. Each emphasizes a different strand of patristic tradition, but all four share a sense of the Fathers as living witnesses to divine-human communion. Yannaras and Zizioulas have also brought to their interpretation of the Fathers some of the insights of modern existentialist philosophy. Although criticized by some, this approach has led to some important thinking on the nature of person and relation. “We orthodox follow the tradition of the holy Fathers and the decrees of the sacred councils.” So wrote Vikentios Damodos early in the eighteenth century (Spiteris 1992, 61). Fidelity to the Fathers—the authoritative ecclesiastical writers, mainly Greek, from Ignatius of Antioch in the second century to Gregory Palamas in the fifteenth who shaped the faith and thinking of the Byzantine Church—has always been the hallmark of Orthodoxy. In Damodos’s time, however, such fidelity was largely formal. The Fathers were often invoked to differentiate Orthodoxy from both Catholicism and Protestantism, but the Orthodox Church had long since lost any sense of a living communion with them. The reasons for this go back to the end of the fourteenth century and to the growing influence of Western scholasticism in the Orthodox world. After the fall of Constantinople an arid Aristotelianism associated with the name of Theodore Korydalleus took hold of theintellectual life of the Eastern Church (Yannaras 2006, 51–8, 63–9). Under the conditions prevailing in the Ottoman empire, all higher education had to be undertaken abroad. Damodos had studied in Venice and Padua. He returned to his homeland to work as a lawyer and schoolmaster. Imbued with the new ideas of the Western Enlightenment, he produced the first Greek handbook of dogmatic theology. This was an innovation in the Orthodox world, where previously, although “Confessions of Faith” had been produced on the Western model in response to pressure from the West, there had not been any attempt at a systematic exposition of doctrine on rational principles. Damodos’s model was the Jesuit Denis Pétau’s De theologicis dogmatibus. While declaring his desire to follow “the God-bearing Fathers, and be guided by them” (Yannaras 2006, 101), Damodos reflects Western intellectualism rather than a patristic outlook. Damodos’s Dogmatics only circulated in manuscript but it set the precedent for later works of the same kind by Eugenios Voulgaris and others, right up to the authoritative manuals of Christos Androutsos (1907) and Panayiotis Trembelas (1959–1963). When Trembelas’s Dogmatics was published in French translation a few years after its original Greek edition, it received a devastating review by Kallistos Timothy Ware (later Bishop Kallistos of Diokleia) who criticised its dated approach and Western perspective (Ware 1971, 479). Nor did he find its use of the Fathers helpful. Trembelas presents his long lists of patristic quotations baldly without any attempt to set them in context: “We are told what the Fathers said; but at times we are still left asking ‘What exactly did they mean?’” (Ware 1971, 480). This use of the Fathers simply as proof texts is a kind of patristic fundamentalism which collects and arranges texts without discussing them or bringing out their significance for today (Spiteris 1992, 244). To a certain extent this reflects an Orthodox sense of the timelessness of the Fathers. “We do not approach them as dead teachers from the past, as we might Plato or one of the classical philosophers,” says Andrew Louth. “We regard them as living now in the life of the Resurrection, more alive than we are, as they are closer to the Source of Life” (Louth 2005, 55). But to come alive for us as teachers and witnesses the Fathers need to be set in their historical context so that we can (Philosophy & Theology 18, 1 79) appreciate the problems they were dealing with and the questions to which they were supplying answers. Otherwise they remain imprisoned in the past, the authors of dead formulaic statements. During the last fifty years Greek theologians have begun to recapture something of the excitement of communion with the Fathers as living witnesses to the Christian faith. Yannis Spiteris, the Roman Catholic archbishop of Corfu and historian of modern Greek Orthodox thought, sees a 1949 article of Hamilcar Alivizatos as marking the beginning of the Greeks’ emergence “from the tunnel of Western ‘scholasticism’” (Spiteris 1992, 225–6). “Today,” wrote Alivizatos, “patristic theology is recognized as the right point of departure for Greek theology” (Alivizatos 1949, 89). How this came to be recognized is interesting, for Greek theology had to look outside Greece to rediscover its own roots. Alivizatos was a professor at Athens university. The Greek universities, however, were not well positioned to act as a springboard for the recovery of patristic theology. The school of theology at Athens had been founded in 1837 on the German model, shortly after the modern Greek state was established. This was the only higher school of theology in Greece until a second theological faculty was founded at the University of Thessalonica in 1925 (Yannaras 2006, 194). retrieval of patristic theology. More specifically, it was the emigré Russian Orthodox theologians at the Institut St Serge in Paris and the French Jesuits at their house of studies in Lyons who were the chief catalysts of the Greek theological renaissance that was beginning at the time Alivizatos wrote his article. The Russians, who had preserved the tradition of Philokalian spirituality which had been lost in Greece, brought to the West, and thence to Greece, a vivid sense of the patristic teaching on divine-human communion. Through their work the Fathers ceased to be wooden testimonies to the correctness of Orthodox thinking and became living guides to spiritual growth. A number of important publications disseminated this fresh approach. George Florovsky’s book on the development of Russian theology appeared (in Russian) in 1937, Vladimir Lossky’s on the Mystical Tradition of the Orthodox Church (in French) in 1944, and John Meyendorff’s on Gregory Palamas (also in French) in 1959. The impact of Meyendorff’s book in particular was almost immediate. In 1962 Florovsky, Lossky, Schmemann, Meyendorff, and others were invited to Greece to participate in a symposium organized by the Zoe brotherhood under the title “Theologia” (Spiteris 1992, 213). Zoe was a movement of moral and spiritual renewal which exercised great influence in Greece at this time. Besides introducing Russian emigré theology to the Greeks, it was also instrumental, though less directly, in transmitting the work of patristic renewal that had been begun by the Jesuits at Lyons. This work, associated closely with the names of Jean Daniélou and Henri de Lubac, had resulted in the founding of Sources chrétiennes in 1942. In 1946 the French Jesuits were joined by a young Greek convert, Demetrios Koutroubis. Within a few years Koutroubis had returned to Greece and to Orthodoxy, bringing back with him a sense of the exciting immediacy of patristic thought. He collaborated with Elias Mastroiannopoulos, the superior of Zoe, in the editing of a new journal called Synoro (Frontier) which was very influential among Greek theologians until it was closed down by the Colonels in 1967 (Yannaras 2006, 294). Koutroubis’s modest house just outside Athens became a meeting place for many seekers after spiritual truth. His visitors saw him as a “lay staretz” who communicated a real experience of the mystical and ascetic tradition of the Greek Fathers. Christos Yannaras, who was one of his disciples says: “He was the first who spoke the ‘new’ language. It was he who wrote the earliest articles in Greece about the theology of St Gregory Palamas and St Nicolas Kabasilas, he who translated for the first time the texts of the great theologians of the Russian diaspora, and—above all—he who gathered around himself a new generation of theologians and trained them by means of the discreet humility of his Socratic method” (Yannaras 1984b, 72). This new approach to the Greek Fathers bore fruit in the younger generation of Greek theologians, the best known of whom are Vasileios Gontikakis, Panayiotis Nellas, Christos Yannaras, and John Zizioulas. All four studied abroad, coming under the direct influence of the Russian diaspora theologians and the new style of Western patristic scholarship. Vasileios Gontikakis (b. 1936) was one of the first of an unprecedented wave of educated young men who went to Mount Athos in the early 1960s in search of the authentic spiritual traditions of Orthodoxy. 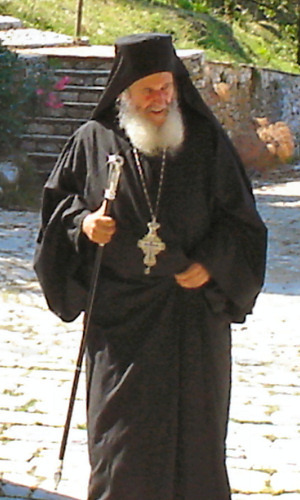 He was a priest who had studied at Lyons and been a member of Koutroubis’s circle. His remarkable qualities were soon recognized and before long he became abbot of Stavronikita, a small and until then moribund monastery among the twenty or so ruling houses of the Holy Mountain. The revival that he spearheaded spread to other monasteries. Stavronikita flourished, and later Father Vasileios was invited to become abbot of the important monastery of Iveron. His best known book, published in English under the name Hymn of Entry (Vasileios [Gontikakis] of Stavronikita 1984), was written to explain the Holy Mountain’s reserve towards ecumenism, especially its hostility towards rapprochement with Rome. But it is not a polemical work. It seeks to draw the reader into the unity of Orthodox theology and worship from his personal experience. The Fathers are not dead figures from the past. 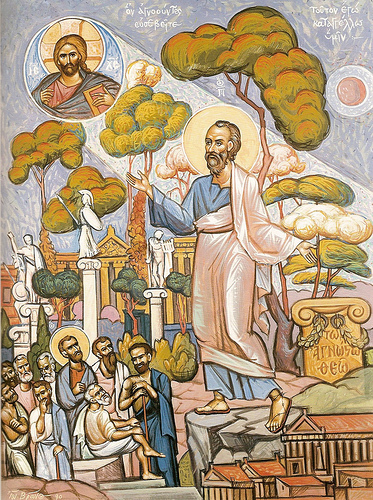 Nor is studying them merely an intellectual exercise: “What is required in patristic study, in order to remain faithful to the Fathers’ spirit of freedom and worthy of their spiritual nobility and freshness, is to approach their holy texts with the fear in which we approach their holy relics and holy icons” (Vasileios [Gontikakis] of Stavronikita 1984, 34). We are to engage with the Fathers as persons, not simply pick out the fruits of their intellectual industry. And this means that “we must put our whole self into studying the fathers” (Vasileios [Gontikakis] of Stavronikita 1984, 34–6). As a result we interact with them and are changed in our inmost being. Read in this way, the patristic word divinizes us, enabling us to become Christs by grace. Gontikakis vividly conveys a sense of the Fathers as contemporary living witnesses initiating us into the true meaning of life. We are encouraged to see them, in Louth’s words, as “genuine human beings with all their faults, beginning to respond to the transfiguring power of the Holy Spirit” (Louth 2005, 57). Another approach, a more familiar one perhaps to Western readers, is represented by Panayiotis Nellas (1936– 1986). His chief work, Zōon theoumenon, published in, Russell: Modern Greek Theologians and the Greek Fathers English in 1987 under the title Deification in Christ, is at first sight a conventional scholarly investigation of patristic anthropology. But his declared aim is not simply to submit the texts to critical analysis. It is to approach the Fathers “from within the Church and using faith as our basic method” (Nellas 1987, 24). The Fathers are to be studied not like any ancient text but from within the community of faith. Nellas, as it were, enters into conversation with the Fathers, letting them take him forward where they will. He does not write with the exalted monastic tone of a Gontikakis. But as a layman he was one of the few Greek theologians, as Spiteris says, who was able to bring theology into rapport with modern Greek culture (Spiteris 1992, 256). Gone now are preconceived theological schemes to which the Fathers added as testimonies. Nellas lets the Fathers show us that God is not an impersonal eternal “principle” but our ontological origin and consummation. When we live theandrically—in imitation of Christ—we realize ourselves by reaching out into infinity; we attain our true fulfilment by extending it into eternity. The Fathers teach us how to do this if we follow their thinking. Such thinking has not to do with abstract principles, for “the spiritual life is not a life of laws and precepts but a life of participation, affection and love, a life of mingling and mixing with God” (Nellas 1987, 116). Spiteris sees in Nellas’s work a personal synthesis that speaks to today’s world: “Western theology can profit greatly from his thought” (Spiteris 1992, 276). With Yannaras and Zizioulas we enter into more controversial territory. In attempting to speak to today’s world they are not afraid of recasting patristic thinking in contemporary philosophical language. The bolder in this respect, given the prominence of Heidegger in his thought, is Christos Yannaras. 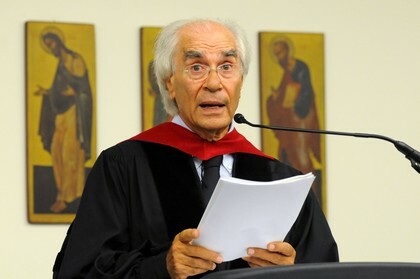 Born in Athens in 1935, he pursued postgraduate studies in Bonn and Paris before being appointed professor of philosophy at the Panteion University of Social Sciences in Athens. He is a layman whose interests focus on the philosophical aspects of Orthodoxy’s theological tradition. Of his many books, the three most important are Person and Eros (on ontology), The Freedom of Morality (on ethics), and Elements of Faith, but he is not a Western-style philosopher of religion. He opposes an absolutized rational affirmation of God, which he sees simply as a construct of the human mind. God is not known by a rationalistic ascent to an operative First Cause. He exists in a personal mode and is known experientially by participation in his energies. Similarly, morality does not consist in obedience to rules and precepts. It consists in the realization of life as communion. The “personal” is contrasted with the “individual.” To be an individual is to be locked in one’s cognitive self-sufficiency. To be a person is to affirm freedom as one’s existential truth, a freedom expressed in selfgiving and loving communion. The Fathers on whom Yannaras relies are revealing. They are the Cappodocians, Dionysius the Areopagite, Maximus the Confessor and Gregory Palamas, the chief representatives of the tradition of apophatic theology and Philokalian spirituality. Also important to him are three great teachers of the ascetic life: Isaac the Syrian, Macarius the Great, and John Climacus. The Latin Fathers are conspicuous for their absence—except when they are attacked. Tertullian, Ambrose and Augustine are seen to provide the basis of the secularized “religionization” of the Christian life which Yannaras regards as the source of all western ills. Augustine in particular is presented as the prime source of the rationalism and intellectualism that has dominated Western culture and imprisoned humanity in an egocentric individualism. These Fathers—the Greek, not the Latin—are treated as guides. In a philosophical approach to the Christian life, which lays emphasis on experience, their witness is invaluable. It is ludicrous to suppose that we have moved on and left them behind simply as historical examples of an earlier phase of understanding. Indeed, there has been no “development” in that sense at all. The Fathers are those who have gone on ahead, who have experienced personal communion with God and have been transformed by him. As Andrew Louth has said, “we cannot expect to surpass the Fathers” (Louth 2005, 60). In their writings they have left us precious indications of how we can follow them as their sons and daughters in faith. By exploring and appropriating their insights, we can come to share in the communion which they already enjoy with each other and with God. Yet in Yannaras’s discussions, the Fathers often share the page with Plato and Aristotle, with Heidegger and Sartre. Yannaras has been accused of dressing up Western existentialism in Orthodox clothing. But the role he assigns to the philosophers is a preparatory one. He values Heidegger for having demonstrated the bankruptcy of the Western philosophical tradition and indicating some very suggestive ways of reading the ancient Greeks. By clearing away the assumptions of the more recent philosophical traditions, he has laid bare the questions to which the Fathers give the answers. Yannaras is by no means a liberal in theological matters but his books have provoked fierce hostility in conservative Orthodox circles. He has been accused of teaching a heretical morality that leads to libertinism, an apophatic theology that ends up in agnosticism, and an Orthodoxy that is just a disguised form of Western existentialism. The first of these charges is based on a complete misreading of Yannaras’s discussion of eros and ecstasy.These terms are not antinomian and Gnostic in origin but derive from Dionysius the Areopagite and signify a going out of the self and seeking fulfilment in communion with God. Hostility to Yannaras’s apophaticism is simply a reaction of the old scholastic mentality to the resurgence of a previously neglected strand of patristic tradition. The accusation that Yannaras has imported Western existentialism into Orthodoxy is more weighty. But again it argues from a very narrow idea of Orthodoxy that gives no weight to Maximus the Confessor and Gregory Palamas. Another complaint that has been made is that Yannaras presents too schematic an opposition between “Western” rationalism and “Eastern” personalism. There is some truth in this but it fails to do justice to the subtlety of his position. “I am not attacking an external Western adversary,” he has recently said. “As a modern Greek, I myself embody both the thirst for what is ‘right’ and the reality of what is ‘wrong.’ . . . My critical stance towards the West is self-criticism; it refers to my own wholly Western mode of life” (Yannaras 2006, viii–ix). Yannaras is fully aware that he cannot escape his intellectual environment. Where he is most vulnerable to criticism is his tracing back of all that is wrong in the “West” to St Augustine. Here he has taken his cue from Vladimir Lossky, John Romanides and John Meyendorff, who present polemical assessments of Augustine that (at least in the case of Lossky and Meyendorff) owe more than a little to the work of the French Jesuit, Théodore de Regnon. A first-hand study of Augustine by Orthodox scholars would do much to dispel the caricature that often informs their writings. Several commentators have drawn attention to the danger that the “return to the Fathers” can simply mean a return to the past. One writer complains that Yannaras does not confront the problems of the Church today “but prefers to mourn a lost reality,” yearning “for the immediacy of life reflected in agrarian society” (Tataryn 1997, 59). It is true that Yannaras has a deep respect for popular Orthodox culture. But he is no romantic. “My aim,” he says, “is not to lament the past in a sentimental fashion, nor is it to resurrect the Greek experiential version of the Church in pursuit of a lost culture” (Yannaras 2006, viii). It is the turning of the Church into a religion that he passionately objects to, so that what ought to be the dynamic source of life and communion becomes instead a reassuring system safely regulating our thought and conduct. To live in rapport with the Fathers of the neptic tradition is to live without the comforts of a “religionized” Christianity. It is to open ourselves in freedom to the transforming power of the divine energies in the community of faith. John Zizioulas (b. 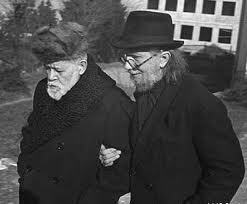 1931) studied at the Universities of Thessalonica and Athens before going on to post-graduate work at the ecumenical institute at Bossey in Switzerland and then under Georges Florovsky at Harvard. He returned to Athens as a professorial assistant. From 1970 he taught in Great Britain—at Edinburgh, Glasgow, and London—and in 1980 also became professor of dogmatic and pastoral theology at Thessalonica. 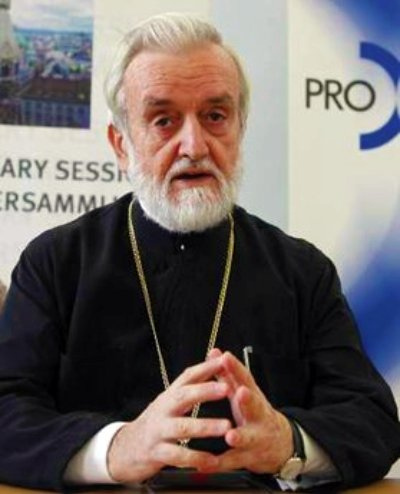 In 1986, while still a layman, he was elected metropolitan of Pergamon by the ecumenical patriarchate and received all the orders of priesthood in the course of that year. As a titular metropolitan, he has devoted himself to ecumenical work, which has made him particularly well known in the West. a person. And a person cannot exist without communion with others. This has implications for the believer too. Baptism “hypostasizes” the believer “according to God’s way of being” (Zizioulas 1985, 19). We approach God through the Son in the Holy Spirit. The economy of the Holy Trinity (the Trinity as operative in the world) is the basis of ecclesiology. The baptized believer, sharing in eucharistic communion, grows into the image of Christ and is, thus, divinized as he or she advances to the eschatological vision of God. Although a careful and accurate patristic scholar, Zizioulas is not interested in the Fathers simply as witnesses to the Church’s past. We need to reappropriate the lost consciousness of the primitive Church, he says, à propos of rediscovering the decisive importance of the eucharist for ecclesiology. But this is also true of the nature of personal being and theology in general. How successful is Zizioulas in his program of patristic retrieval? His approach has been criticized for misreading the Fathers. André de Halleux, for example, strongly objects to Zizioulas’s giving priority to “personal” categories over essential ones in his exposition of the Cappadocian Fathers (Halleux 1986). Most recently Lucian Turcescu has argued that Gregory of Nyssa does not distinguish between “person” and “individual” and that, therefore, a relational ontology cannot be extrapolated from the Cappadocian Fathers (Turcescu 2002). Two Greek scholars already mentioned in connection with Yannaras, J. Panagopoulos and S. Agouridis, accuse Zizioulas of attributing to the Fathers ideas that he has in reality imported from philosophical personalism and existentialism (Panagopoulos 1985; Agouridis 1990). Zizioulas has responded vigorously to these attacks, defending the patristic basis of his theological approach (Zizioulas 1991). He is fully aware of modern philosophical currents, which have influenced his thinking but not determined it. His version of personalism does not refer to God in purely personal terms, ignoring the category of substance. He is faithful to the spirit of the Fathers but is not thereby prevented from building on what they say. After all, the Fathers themselves did not simply repeat the words of their predecessors. Then as now dogma needed to be related to contemporary concerns. Those who are persuaded by Zizioulas include Spiteris, Yannaras, and Papanikolaou. Spiteris finds Zizioulas’s theological synthesis entirely convincing and potentially very important for the development of Catholic thought (Spiteris 1992, 416). Yannaras says with justification that “no other theologian since Palamas has had a comparable impact on Orthodox thought” (Yannaras 2006, 289). 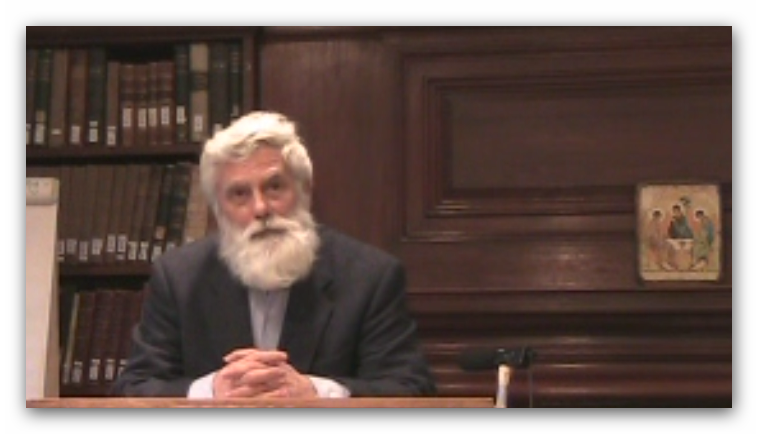 Papanikolaou, after briefly examining his patristic hermeneutics, finds it difficult to see how, if the core of the Christian faith is divine-human communion, Zizioulas is not right in claiming on the basis of the Fathers that this implies an ontology that is relational and personal (Papanikolaou 2006, 161). Another important aspect of Zizioulas’s retrieval of a patristic approach is the implications this has for Christian ecumenism. The studies presented in Being as Communion “are intended to offer their contribution to a ‘neopatristic synthesis’ capable of leading the West and the East nearer to their common roots, in the context of the existential quest of modern man” (Zizioulas 1985, 26). Zizioulas does not ignore the different perspectives which the Western and Eastern Fathers represent. “An Orthodox with some knowledge of history,” he says, “can identify a Western Christian immediately with Tertullian and Augustine—as soon as he or she begins to take part in ecumenical discussions” (Zizioulas 1986, 65). Unlike Yannaras these Fathers are not regarded as in error, but simply as the Western counterparts of the Eastern Fathers. The one truly ecumenical figure among the Fathers is St Maximus the Confessor (c. 580–662). Maximus was a monk deeply learned in the Eastern theological tradition. In the Christological disputes following the Council of Chalcedon (451), he opposed official policy, which sought to modify the Council’s teaching in the interest of imperial unity, and allied himself with Pope Martin I and the Roman Church. He was arrested, put on trial and suffered ill-treatment leading to his death for his fidelity to the two-nature doctrine of Christ defined at Chalcedon. Maximus was also one of the most philosophically informed of the Church’s ascetical teachers, who has contributed much to the expositions of relation and personhood by both Zizioulas and Yannaras. Zizioulas seeks to co-opt the Fathers into the task of restructuring theology. He points out that a “return to the Fathers” is more possible than a “return to the New Testament”: “We cannot reproduce Paul or Peter, who saw the Lord,” but “Ignatius can be reproduced in that he could claim no access to the Lord more than a modern bishop can” (Zizioulas 1980, 41). constructing a theology that addresses modern concerns. Zizioulas seeks to bring together the particular strengths of each side—Western historicism and the Eastern eschatological focus. The Fathers must be seen in their proper context in the past, but at the same time they are “our Fathers” who are “living now in the life of the Resurrection” and can lead us into a deeper understanding of the mystery of Christ (Louth 2005, 55). In conclusion, it must be confessed that the foundations laid by these authors for a fruitful re engagement with the spiritual teaching of the Fathers have not yet been built on by the younger generation of Greek theologians. It may well be that, with more of the works of Yannaras, Zizioulas and others appearing in English, the initiative will now pass to Orthodox theologians in the new world.